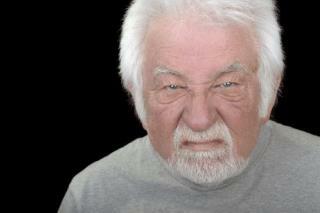 And more so for men: Those in their 60s are four times grumpier than their female counterparts. The study also tracks a depressing stat on laughter: Infants laugh aloud 300 times a day, but the figure drops to six times for teens and four for 20-somethings. After a slight rise for 30-somethings (probably because they had babies), it continues a descent to 2.5 times a day for 60-year-olds. What a strange study. I wonder how things are different for people in their 30s who don't have kids. pain=grumpy...maybe older folks are just suffering more than most younger folks. I can not believe this study. I am now the exact GRUMPY age highlighted and I laugh a lot every day. If I laughed twice as much when I was a teenager I would have been thrown in the loonie bin! As a matter of fact I think my sense of humor has gotten better with age. There is so much more that I laugh about today that in the past I would have gotten angry about, or some such rumpus. Perhaps these were just a bunch of gloomy Englishmen in this Welsh study. I mean really? Have you ever been to Glamorgan? It's perpetually cloudy wet, windy and economically depressed. Maybe they should Interview a wider range of people.